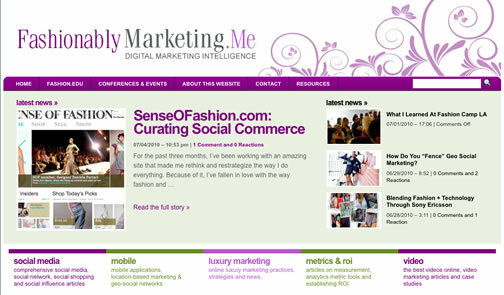 This is the first in a series of posts about social media marketing thought leaders in fashion. Throughout this series, I will feature an outstanding individual in the fashion industry that stands out in the social media landscape. What makes Macala our first Social Fashion Thought Leader is that she really knows how to use the tools of the trade. She includes photographs from real-world fashion, social media sites to better define the five ways social media changed fashion in 2009. About six months ago Macala Wright Lee’s “5 Ways Social Media Changed Fashion In 2009,” appeared in Mashable – the top source for news in social and digital media, technology and web culture. This entry was posted on July 7, 2010 by Barbara Elizabeth. It was filed under Fashion On The Web, Social Media Marketing Thought Leaders In Fashion Industry and was tagged with digital marketing, Fashion, Fashion 2.0, Fashion 2.0 thought leaders, fashion brands, merchandising, Social Media Marketing, social media marketing in fashion industry, thought leaders. Thank you for the kind words, I appreciate it. Great to see you writing in the space, I’ll keep my eye on the site. Email if you ever have a question. You’re welcome … I’ve found my voice! Thanks for your comment.